In the last installment, we noted that a bicyclist is subject to the rights and responsibilities of a “driver of a vehicle”, as well as some special rules which apply specifically to bicyclists; and that there were important legal distinctions between the driver of a motor vehicle and a bicyclist. Today we examine a special responsibility applicable only to the driver of a motor vehicle — the duty to overtake a bicyclist proceeding in the same direction not only safely, but with a minimum of three feet of clearance. A. When overtaking and passing a bicycle proceeding in the same direction, a person driving a motor vehicle shall exercise due care by leaving a safe distance between the motor vehicle and the bicycle of not less than three feet until the motor vehicle is safely past the overtaken bicycle. Note that the minimum safe distance of not less than three feet, subsection A, applies on all streets in Arizona. Streets come in a wide variety of configurations, most streets are divided into lanes, but others are not, some have shoulders, or no shoulders, paved or unpaved, some have designated bicycle lanes, many do not. The minimum safe distance of not less than three feet applies on all streets in all configurations regardless of the position of the bicycle to be overtaken. On many streets with lanes, the lane is not wide enough to safely share side-by-side with a vehicle and the bicycle. Drivers of vehicles in this situation will need to change lanes, at least partially, in order to pass safely and legally. Since the adjacent lane must be clear to move even partially into it, the Coalition encourages drivers to make a full lane change when passing, the same as when passing any other vehicle. There is a misunderstanding that the minimum safe distance of not less than three feet does not apply on streets with designated bike lanes; this is simply not true. Subsection C states that the enhanced fines of subsection B do not apply if a bicyclist is struck while riding outside of a “passable” designated bicycle lane. It has no relevance to Subsection A. Subsection A always applies. Note that Subsection C is presumably poorly drafted in that it does not allow for a bicyclist who is legally turning left to be “protected” by subsection B — although an overtaking motorist is still, as always, required observe the minimum safe clearances specified in subsection A. (c) Knowledge of safe driving practices and the traffic laws of this state, including those practices and laws relating to bicycles. So how does the state educate drivers? 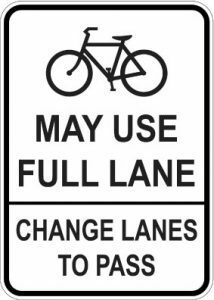 Because, as an everyday bicycle commuter I see very few drivers who obey the law, especially here in downtown Mesa, where you can see almost every driver who passes a bike violates this law and the police do nothing, ever. Laws on the books are a good start, but it they are not enforced they are worthless. 28-735 has been on the books for how many years now – 15?, and how many times has this law been used in the multiple fatalities caused by a motorist striking and killing a cyclist from behind? With regard specifically to fatal overtaking collisions, police have, in fact, been very good about citing for 28-735 appropriately. For example, last year a driver misjudged overtaking space and killed bicyclist Ethelyn Hartline in Yavapai County and was cited. In some other cases, citations are not brought because of impending felony criminal charges, e.g. the driver who killed Highly Falkner in November 2014 is currently being charged with Manslaughter. Fatalities are, of course, relatively rare. And the Coalition does, as much as feasible, monitor each one — here’s a list of every bicyclist killed in Arizona since 2009, along with some varying level of detail on each one. So the real challenge is to bring enforcement and education to the myriad of daily interactions.